Home > Customer Reviews > Josh was great! Brendan was very helpful providing information on the new vehicle and working with me to get the right vehicle for me. Fantastic. Brittany Deveau went above and beyond to satisfy our needs. Daniel was also a good help as a new sales rep - it was a learning experience for him as well as us. Casandra answered all our questions without hesitation. Overall, I am very satisfied with the service that I received from Bruce Hyundai and I would recommend to all my friends and family the Hyundai dealership. I will not hesitate to take my vehicles for service at Bruce Hyundai. 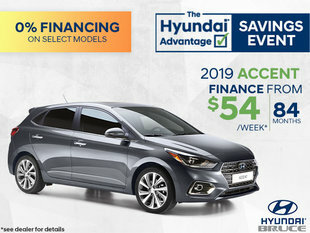 Thank you to Bruce Hyundai dealership! Great service!